Whenever I’m at my parents’ house for the weekend, I look forward to breakfast after church on Sunday because my dad always makes his signature breakfast. 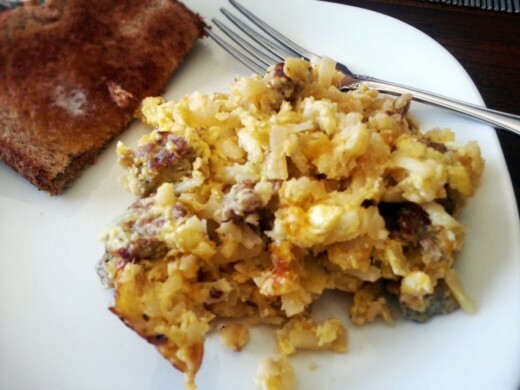 He cooks hash browns, onions, sausage and eggs together in a skillet, and tops it with cheese. The combination of these flavors is amazing and I was able to talk him into sharing his famous recipe. In a large skillet, heat olive oil (enough to coat the pan) over medium heat. Add 2 1/2 cups of shredded hash browns (my dad always uses frozen) and ½ cup of diced onion to the olive oil and cook until hash browns are heated through and slightly golden brown. In a separate skillet (or in the microwave) cook four sausage patties. When cooked, cut each patty into bite sized pieces. In a small bowl, whisk together eight eggs, 1/4 cup of milk, 1/2 teaspoon each of salt and pepper. Add the sausage patties to the hash browns and pour the eggs on top. Cook, stirring occasionally, until eggs are almost set. Add four slices of American or Velveeta cheese and continue to cook until eggs are fully set and the cheese is melted. 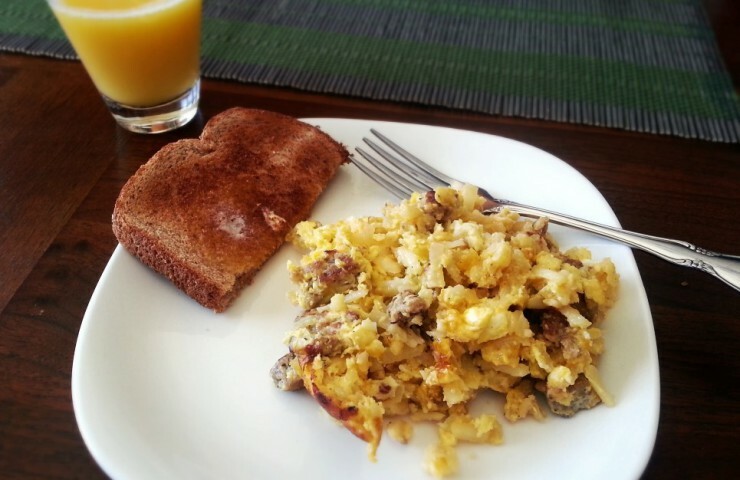 Serve immediately with toast, fruit, or whatever else you typically enjoy for breakfast! 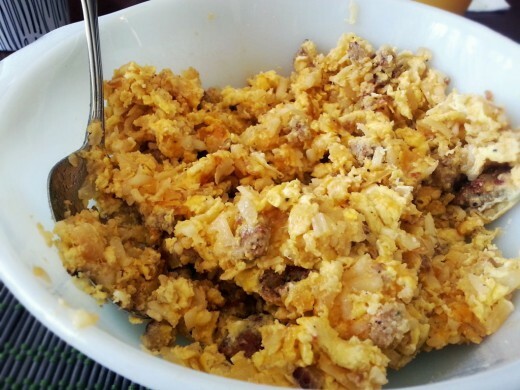 This recipe would also work great as the filling for breakfast burritos. Just warm up tortillas, fill with the mixture and roll them up. You could even add some salsa or hot sauce for a little extra kick. In a large skillet, heat olive oil over medium heat. Add shredded hash browns and diced onion and cook until hash browns are heated through and slightly golden brown. In a separate skillet cook four sausage patties, then cut each patty into bite sized pieces. In a small bowl, whisk together eggs, milk, salt and pepper. If you prefer bacon over sausage, substitute one slice of cooked, crumbled bacon for each sausage patty.